Happy Friday everyone. 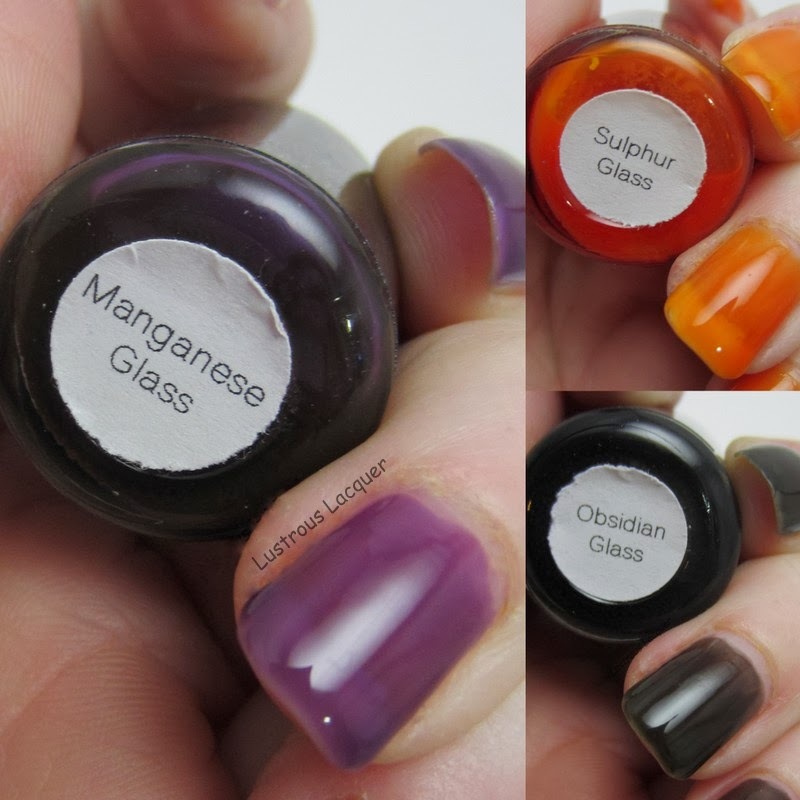 Today I have the pleasure of reviewing 3 polishes from Ellagee's Stained Glass Collection. I was able to purchase these polishes at a discounted rate in exchange for my honest opinion. And I have to tell you I am in love. I plan on picking up the rest of the collection at a later date and will review those as well. hence the "part 1" portion of the blog title. Since I don't own the other polishes yet parts 2 and 3 will be at a much later date. =( Warning, this post is going to be pretty picture heavy. Application of all 3 polishes was the same throughout the group so I'll talk about that at the end. Now let's get to the polish! First up I have Sulphur Glass. An orange jelly polish that builds in opacity with each coat. While being super shiny this polish is never meant to reach full opacity on its own. Show here is 3 coats if Sulphur Glass without top coat. Just look at that shine! Now I'm not usually an orange polish person but I picked this one up because I saw a ton of possibilities with it. I'm very glad that I did, it looks so soft and squishy on my nails. The Picture on Etsy showed a stamped image between layers. I thought it looked so cool that I had to do my own version. I used my Konad polishes in Black and White with Bundle Monster plate BM01 for this look.The black polish actually looked brighter and more define layered between the polish. The white had the opposite effect. I'm not sure which look I like better. This is 4 coats of Sulphur Glass for the finished mani without top coat. Next up is Obsidian Glass. A Super shiny transparent black jelly. Obsidian glass also deepens in color as it's layered and with 3-4 coats, full opacity *should* be reached. I say should because I only used 3 thin coats total in my manicure and I still have slight VNL. Here I have 2 coats of Obsidian Glass without topcoat. Again we have an extremely shiny squishy polish. I knew the minute I saw this polish that I had to have it in my collection. There's just something about this black jelly that called to me. Maybe it was because it reminds me of the smoked glass table I had in my first apartment, or maybe it was because it's unlike any other polish I have come across. Whatever it was, I'm glad I followed my gut and snagged this one. For the stamping with this one, I knew that black wouldn't show up. For fun, I compared Color Club's Cloud Nine and Konad White. I wanted to see what a holographic polish would look like sandwiched between jelly layers. The image is from Bundle Monster plate BM206. Cloud Nine gives a softer subtle stamped effect while the white still looks pretty cool. Can you tell I'm slightly hooked on the stamped sandwich! This look has a total of 3 layers of Obsidian Glass without topcoat. And last but not least we have my favorite of the 3, Manganese Glass. A transparent purple jelly. Like Sulphur Glass it's not meant to reach full opacity on its own. When I first got my bottle I thought there might have been a mistake. It's so dark purple it almost looks black and I was slightly worried. As you can see I had absolutely nothing to worry about. Here I have 2 coats of Manganese Glass without topcoat. Would you look at that shine! And that shade of purple! Dying I love it so much. It's not quite plum, but maybe a watered down version of plum. I know that description doesn't make it sound appealing, but I'm having a hard time describing it. Maybe a smokey purple haze? However you choose to describe it, it's stunning. Of course, I had to include another layered stamp. I used Bundle Monster plate BM14 with my Konad Black and White. Even though there isn't as much contrast in images with the black, I like it more than the white. It seems to blend in and stand out at the same time. The white still gives an amazing effect though. This final look is 3 coats of Manganese Glass without top coat. Now about that application.... it appears to be streaky at first and you might be tempted to go over your nail multiple times to even things out. Don't. These polishes are self-leveling, and they even out to a flawless, streak-free finish all on their own. Sulphur Glass was a little light for me after 2 coats and ended up needing a third for my personal taste while the other two reached the desired look after 2. All in all, I was extremely happy and as I stated earlier will be getting the rest of the collection. If you'd like to pick up your own bottle they can be purchased on Esty where a full sized bottle will run you $8.75. And don't forget to check out Ellagee on Facebook so you can keep up with new releases and all the fun polish news. Whew...that was a long post! Thanks for sticking with me till the end and as always, Happy Polishing! They really are. So easy to work with. I just love them! Wow, beautiful polishes and excellent stamping! I can't decide if I like the stars or cupcake combos better...too pretty! Thanks =) I had a lot of fun with these. I like the stars better to be honest but Manganese Glass was my favorite color of the 3. I love these polishes and the stamping too! So squishy!! These are my first true jelly polishes and I'm hooked. I love how squishy they look!